Former world boxing champion Hector “Macho” Camacho has been left brain dead after being shot in his native Puerto Rico, with his family facing the agonizing decision of taking him off life support as his condition worsened. 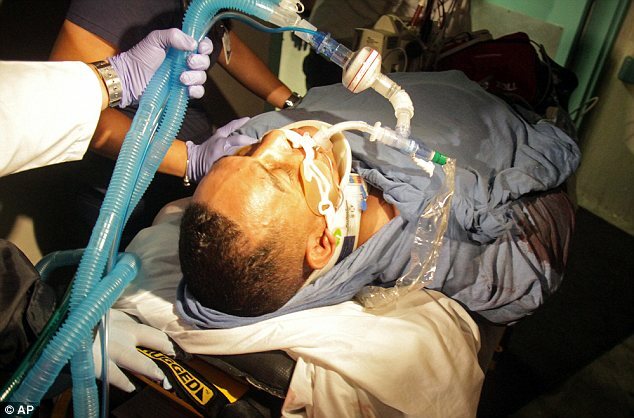 Doctors had earlier said Hector Camacho would survive after he was shot in the face while sitting in a car on Tuesday night in his hometown of Bayamon. However, his condition deteriorated overnight and his heart stopped at one point, said Dr. Ernesto Torres, director of the Centro Medico trauma center in San Juan. “It would be a miracle for him to recuperate,” Dr. Ernesto Torres said on Wednesday. Specialists consulted with Hector Camacho’s mother Maria Matias, who arrived from the U.S. mainland, and had a nervous attack at the hospital. The family faced the agonizing choice of when he should be removed from life support, said Ismael Leandry, a longtime friend and former manager who was also at the hospital. The 50-year-old Hector Camacho was outside a bar in a parked car with a friend when he was shot in the face. The friend, whose name has not been released, was killed. No arrests have been made and no motive has been disclosed. At least one gunman opened fire on their vehicle in the city of Bayamon, according to police. The bullet struck Hector Camacho in the jaw but exited his head and lodged in his right shoulder and fractured two vertebrae, Dr. Ernesto Torres said. He had said the boxer, who was trailed by drug and alcohol problems during a career that included some high-profile bouts, could be paralyzed from the shooting. “Camacho’s condition is extremely delicate,” Dr. Ernesto Torres told Telenoticias. Hector Camacho’s representative Steve Tannenbaum said he was told by friends at the hospital that the boxer would make it. “This guy is a cat with nine lives. He’s been through so much,” he said. Hector Camacho’s last title bout came against then-welterweight champion Oscar De La Hoya in 1997, a loss by unanimous decision. Steve Tannenbaum said he was going to fight two years ago in Denmark until his opponent pulled out and that they were looking at a possible bout in 2013. “We were talking comeback even though he is 50,” he said. Hector Camacho was born in Bayamon, one of the cities that make up the San Juan metropolitan area. He won super lightweight, lightweight and junior welterweight world titles in the 1980s. He has fought other high-profile bouts in his career against Felix Trinidad, Julio Cesar Chavez and Sugar Ray Leonard. Hector Camacho knocked out Leonard in 1997, ending what was that former champ’s final comeback attempt. He has a career record of 79-5-3, with his most recent fight coming in 2009. Drug and alcohol problems have trailed Hector Camacho since the prime of his boxing career. He was sentenced in 2007 to seven years in prison for the burglary of a computer store in Mississippi. During the arrest in January 2005, police found him in possession of ecstasy. A judge eventually suspended all but one year of the sentence and gave Camacho probation. He wound up serving two weeks in jail after violating his probation. He divorced from his wife several years ago after she filed multiple domestic abuse complaints against him. Hector Camacho was born in Puerto Rico but raised in Spanish Harlem, New York. His son Hector Camacho Jr. is also a boxer.